No, the coop is not yet finished, but as the chicks will be spending their first weeks inside the house, we’re well on track for finishing by the time they need it. 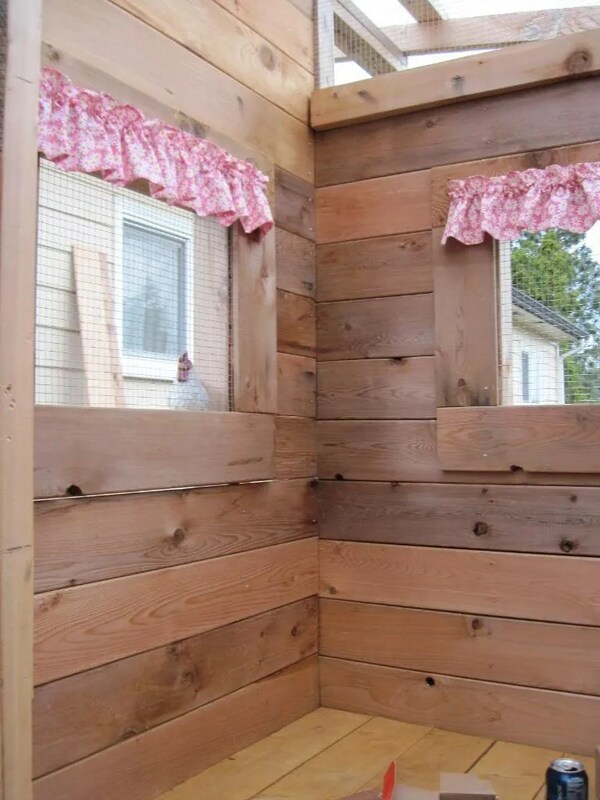 We did add a decorative feature to the coop: curtains! Pretty much all the major stuff that’s left to do on the coop is attach the doors and wire in the run. Since it’s *possible* that the chicks could come as early as tomorrow (though most likely not until Weds), we set up their indoor quarters. It’s an appliance box of some kind, with a lining of plastic, paper towels, and pine shavings. 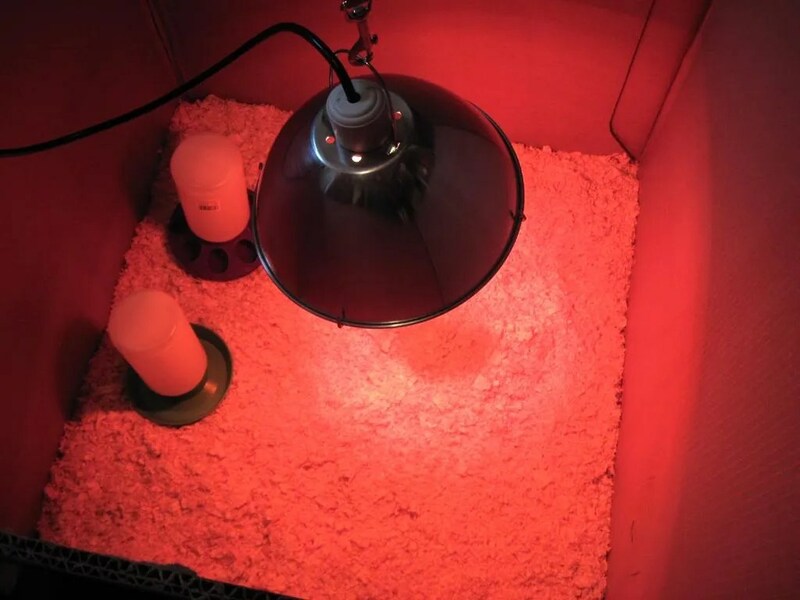 We’re working on getting the temperature right, using the heat lamp. 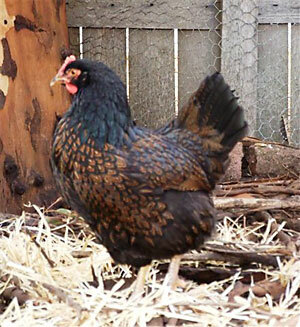 The penultimate chicken breed we are getting is the Barnevelder. The Barnevelder originates from the Barneveld region of Holland where it is so well-known that, according to the Barnevelder Club of North America, the Barnevelder name is synonymous with the word chicken. It is sought after there for its dark “chocolate” brown eggs, and while Barnevelder eggs in this country have lost some of that dark pigment, breeders here are working hard to change that. This beautiful bird is hardy and quiet and doesn’t mind being confined. In short, it makes a wonderful pet! 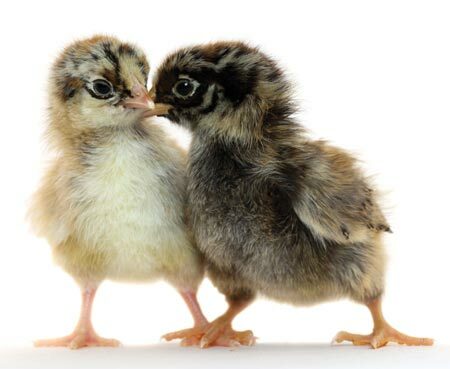 It seems to be quite rare and quite loved in North America; every chicken breeder we speak to is delighted that we’re getting one. We’ve had a couple of people say it is their favorite chicken! This is the one breed that we almost didn’t get. There is only a limited number available, and at first we were told they were all sold out. Hopefully we’ll get even luckier and get a hen that lays the really dark eggs. This entry was posted in chickens and tagged baby chicks, backyard chickens, barnevelder, chicken coop, chickens. Bookmark the permalink. That’s a great looking coop. I love the curtains! I adore my Barnevelder hens. They are so gentle and graceful and calm! 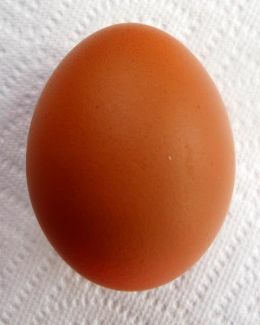 I just got my first eggs this week. One hen laid four eggs over six days, which seems like a pretty strong start to me. The eggs aren’t particularly dark or large, but they are beautiful, and well worth the wait. I expect the eggs to become larger over time as the bird continues to mature. She is just under seven months old now. Now that my hens are a little over two years old, I can say that the only negative thing about my Barnvelder is her desire to go broody several times each summer. If you wanted to raise babies, she’d be a brilliant mother, so sweet and gentle! I did find and watch your video of your broody Barnevelder hen. It was very funny … from a safe distance. I imagine that it’s not so funny when you have to deal with it several times each year. We’ll see whether I have the same problem with either of my two Barnevelders. From what I’ve read, broodiness is rather uncharacteristic of the breed. I also have two Welsummers, who are reportedly even less likely to go broody. I have a Welsummer too, and I love her. She is the sweetest hen, so affectionate and beautiful. She’s never gone broody, and she lays the prettiest dark speckled eggs. My Barnvelder does seem to be getting better with her broodiness. Last year, she was so stubborn that it was really difficult to make her stop. This year, although she’s gone broody twice, I was able to get her over it in a couple of days by keeping her confined where she couldn’t sit on her nest. It’s remarkable how these silly little birds can capture our hearts, isn’t it?